A new prosthetic leg in development at Vanderbilt University offers users a more natural gait thanks to computers, electric motors, and presumably psychic powers. Over the past seven years, the Vanderbilt Center for Intelligent Mechatronics has been hard at work on a new prosthesis design that incorporates powered joints and computerized sensors into what has traditionally been a static system of hinges. The goal is to create an artificial leg capable of predicting its wearer's next step, based on muscle contraction and joint manipulation. Think: MechWarrior-style battle armor, only for your missing leg, and with far fewer LRM-20s. 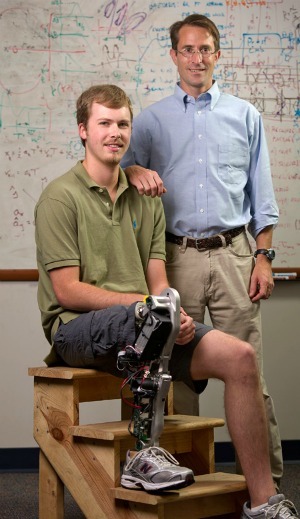 The device uses the latest advances in computer, sensor, electric motor and battery technology to give it bionic capabilities: It is the first prosthetic with powered knee and ankle joints that operate in unison. It comes equipped with sensors that monitor its user's motion. It has microprocessors programmed to use this data to predict what the person is trying to do and operate the device in ways that facilitate these movements. "When it's working, it's totally different from my current prosthetic," said Craig Hutto, the 23-year-old amputee who has been testing the leg for several years. "A passive leg is always a step behind me. The Vanderbilt leg is only a split-second behind." While it won't allow you to fend off the Ghost Bear Clan, the new leg does drastically improve the quality of life for its users. "Going up and down slopes is one of the hardest things to do with a conventional leg," said Hutto. "So I have to be conscious of where I go because I can get very tired walking up and down slopes. But that won't be a problem with the powered leg because it goes up and down slopes almost like a natural leg." The above examples of how this new limb can benefit people are impressive, but they are merely an extrapolation of what prostheses already do. What's really impressive about the Vanderbilt leg is what it exclusively can offer wearers. An "anti-stumble routine" for instance. According to its creators, if a wearer stumbles while walking on the limb, the leg will notice this, correct its position in relation to environmental obstacles, and essentially "catch" the person before they fall. All of this in a device that weighs only nine pounds. The Center for Intelligent Mechatronics is also hard at work on a prosthetic arm with these same predictive capabilities, though given the wide range of utility the human arm has, a finished model is still a ways off. Obviously this is great news for amputees and anyone else who ever finds themselves bereft of a leg, but what of those of us cursed with a full complement of fleshy, unintelligent limbs? My leg is pretty cool, I guess, but it's never once attempted to stop me from falling on my head. At best it might throw some totally sweet spinkicks, but compared to this self-correcting prosthesis human biology is such a let down.